A province (formerly presidency) and one of the ten great governmental divisions of British India, bordering on the Arabian sea, and lying between lat. 14° and 29° N, and Ion. 66° and 77° E. It comprises a strip of territory about 900 m. in length, extending from the northern limit of Sinde to the kingdom of Mysore on the south, along more than two thirds of the W. coast of Hindostan. Its greatest breadth is 250 m. According to the British parliamentary accounts for 1870, the area is 87,000 sq. m., and the population in 1871 was 13,983,998. The province contains 22 districts, apportioned among three commission-erships, Sinde in the north, and the northern and southern divisions of Bombay proper, in which are comprehended Ahmedabad, Kaira, Surat, Broach, Bombay island, Darwar, Can-deish, Tanna or North Concan, Rutnagherry or South Concan, Poonah, Ahmednuggur, and Canara. The large native feudatory states of Cutch and Guzerat, the chiefs of which are subject merely to British supervision, intervene between Sinde and the northern and southern divisions. The coast line is about 1,050 m. in length. Considered with reference to its physical characteristics, the province.is divisible into four regions: 1, the Sinde territory, in the north, comprising the low and level basin of the Indus, where strips of exceedingly fertile country alternate with deserts produced by lack of irrigation; 2, the two Concans, which form the rugged and hilly maritime belt, about 330 m. long and from 25 to 50 m. wide, lying between the Western Ghauts and the Arabian sea; 3, the eastward slope of the Western Ghauts; and 4, the flat, alluvial tracts W. of the gulf of Cambay, in the Nerbudda districts. There are great meteorological differences between these several regions. The climate of Sinde is exceedingly sultry and dry, with a very light rainfall, and an average maximum temperature at Hydrabad, the capital, of 98-5° F. in the shade. In the Concans, on the other hand, while the heat is as great, the annual fall of rain is much larger. This is due to the action of the Western Ghauts in condensing the vapors of the S. W. monsoon as it blows in from the sea; but the same cause leaves the eastward slope of the range comparatively rainless. At Bombay island the average annual temperature is about 80° F., with a maximum of about 100° in the shade; and the rainfall averages 80 inches per annum, .sometimes rising nearly to 100 inches. The Western Ghauts are the most important mountains in the province; within its boundaries the altitude of the range varies from 1,000 to 4,700 ft. The Indus, Nerbudda, and Taptee are the principal rivers. The vegetable productions comprise cotton and rice in the coast districts, sugar and indigo in Candeish, and wheat, barley, hemp, and tobacco in Sinde. Opium is manufactured in the native states of Malwa and Guzerat, and merchants who wish to send it to the city of Bombay obtain permits from the government at a certain price per chest. Considerable quantities of silk are raised, and there are silk manufactories in some of the towns. The land revenue system of Bombay was carefully planned and put in operation about 20 years ago. It provides for a survey and assessment of the whole province, which work is now almost completed. With few exceptions, the occupants of the land hold directly from the government, and pay their rent to government officers. The fields are mapped, and marked out by permanent objects, to remove which is a penal offence; they are then classified for assessment, with reference to the soil, climate, proximity to market, and other external conditions. When the existing rate was fixed, it was equal to one half the yearly value of the land; but in consequence of the general improvement of the country the proportion is now not more than one fourth or one eighth of that value, except in the poorer districts. A revision of the assessment may be made at the end of every 30 years. The land revenue yields a larger sum per capita in Bombay than in any other province of India. The administration is vested in a governor appointed by the crown with the advice of the secretary of state for India. He is assisted by three councillors and a legislative council. There are 300 schools in the province, under government supervision, with an attendance of 13,000 scholars, five sixths of whom are instructed in the native languages only, the remainder being taught English. Religious establishments are maintained by the churches of England and Scotland. In the year ending March 31, 1870, the value of the imports into the province was £22,232,435, and of the exports from it £24,-690,819. The length of the railway lines open for traffic there on Dec. 31 of the same year was 1,184 m.
The chief towns, in addition to the city of Bombay, are Hydrabad and Kur-rachee in Sinde, Surat and Baroda in the region E. of the gulf of Oambay, and Poonali in the highlands E. of the Ghauts, 2,000 ft. above the sea level. - The sepoy mutiny of 1857 did not attain any serious magnitude in Bombay. A few conspiracies were detected in widely separated localities, and immediately suppressed. The native troops remained for the most part faithful to the British. Two ringleaders in a plot for the massacre of all the European residents of the capital were summarily punished by being blown away from the mouths of cannon. II. A city, capital of the province, picturesquely situated on an island of the same name close to the W. coast of Hindostan, in lat. 18° 56' K, Ion. 72° 53' E., separated from the mainland by an arm of the sea; pop. in 1871, 646,636, of whom about 450,000 were Hindoos, 120,000 Mohammedans, 30,000 Parsees, and 8,000 Europeans. The island, which was the first possession ever acquired by the British in India, is 8 m. long and nearly 3 m. wide, and the city occupies its southern extremity. Toward the close of the 15th century it was conquered by the Mohammedans, who ceded it to the Portuguese in 1530. Shortly before the marriage of Charles II. and Catharine of Braganca, infanta of Portugal (1562), it was conveyed to the English crown as a portion of the dowry of that princess. About seven years later the king transferred it to the East India company, who held it at an annual rental of £10 sterling up to the year 1859, when the home government assumed direct control of all the British East Indian possessions. Bombay is the busiest and in appearance the gayest of the cities of British India. The ancient portion is known as the Fort, and contains numerous handsome buildings. The houses within the walls are built of wood, surrounded with verandas, and covered with sloping roofs of tiles. The poorer classes occupy dwellings of clay thatched with palmyra leaves. There are many large storehouses and commercial establishments, and in the European quarter are numbers of fine residences. Of the public buildings the more prominent are the Anglican cathedral, the various churches, temples, and synagogues, the government house, the town hall, the custom house, the Grant college of medicine, and the hospital founded by the Parsee merchant Sir Jamsetjee Jejeebhoy, and bearing his name. The city is now connected with the neighboring island of Salsette by means of a recently constructed causeway and arched stone bridge. By far the most interesting structures in the vicinity of Bombay are the celebrated cave temples of the Buddhists, excavated from the solid rock and adorned with colossal statues, on the island of Elephanta, which lies at a distance of from 6 to 8 m. - The harbor of Bombay, as the name of the city indicates, is safe and commodious, being one of the best in all India. It is enclosed by Colabba, or Old Woman's island, Bombay island, and the island of Salsette, on the west and north, and by the islands of Elephanta and Caranja, together with the mainland, on the east. It is between 12 and 14 m. long, between 4 and 6 m, wide, and has a depth of from 7 to 14 fathoms. A lighthouse 150 ft. high stands on the southern end of Colabba island. The rise and fall of the tide are sufficient to permit the construction of wet docks capacious enough for building large ships; and in those belonging to the East India company merchant vessels of the largest class, and even frigates and line-of-battle ships, have been built by the Parsees. As the material used for ship building at Bombay is exclusively teak, the vessels constructed there are noted for their durability. The city is both a naval and a military station, but the fortifications, although extensive, are not adequate for defensive purposes against a well equipped foe. Preeminent among the natives for their intellectual capacity, their industry, their business ability, and their great wealth, are the Par-sees, the descendants of the ancient fire-worshippers. Socially, commercially, and politically, they constitute, after the Europeans, the most influential class in Bombay. Their walled cemetery, carefully guarded, stands on the summit of Malabar hill, the most fashionable suburb of the city. It contains five round towers, each about 60 ft. in diameter and 50 ft. in height, and surmounted by a large grate. The bodies of the newly dead are placed upon these towers, and when the vultures have removed the flesh from the skeleton, the bones fall through the grate into the enclosure be-neath. : - The external trade of Bombay is very extensive, and is carried on principally with Great Britain, France, China, Mauritius, and the ports of the Arabian sea and Persian gulf. Cotton is by far the most important article of export. The rise in price and the increased demand growing out of the civil war in America were followed by an era of the wildest speculation in commercial circles at Bombay, from 1862 to 1865, resulting in a financial panic so disastrous that for a time there was said to be not one solvent merchant in the entire city. The exceptional activity of this period, however, contributed in no slight degree to its present prosperity. The exports of cotton to Europe for six years ending with 1872 averaged nearly 1,100,000 bales a year. In 1863-4 opium to the amount of £5,548,-158 was exported, principally to China. The other leading exports, in the order of their total values, for the same year, comprise wool, seeds, cashmere shawls, coffee, grain, spices, sugar, tea, silk and silk goods, saltpetre, and tobacco. 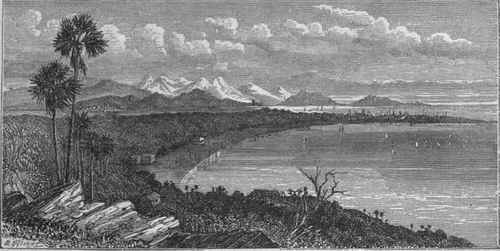 The first railway in the East Indies was that between Bombay and Tanna, opened April 6, 1853. Bombay is now the terminus of the Bombay, Baroda, and Central India railway, and of the Great Indian Peninsula railway, as well as of steamship lines from England. There is telegraphic communication with Calcutta, opened in 1854, and with Falmouth, England, opened in 1870, by means of cables, avoiding all land communications, by way of Aden, Malta, and Gibraltar. As the capital of the province, Bombay is the residence of the governor and of an Anglican bishop. The provincial high court is also held there. Prominent among the institutions of the city is the royal Asiatic society, famous for its successful efforts in behalf of oriental learning. Several missionary establishments are maintained by Europeans and Americans.